It’s that time of year again, Valentine’s Day is just around the corner. The day that you give your “sweetie” flowers, a card and some candy as a token of your love. Valentine’s Day has always been one of my favorite holidays. I have been a lifelong crafter and fondly remember making construction paper hearts surrounded by doily lace as a child. These paper hearts gave me so much joy, and it was always a thrill to give them to my friends. Today’s papercraft is a bit more complicated than a lace doily heart but still cute and relatively easy to make. This hexagon shaped gift box topped with a paper flower is perfect as a Valentine gift, but could also be used for other holidays. 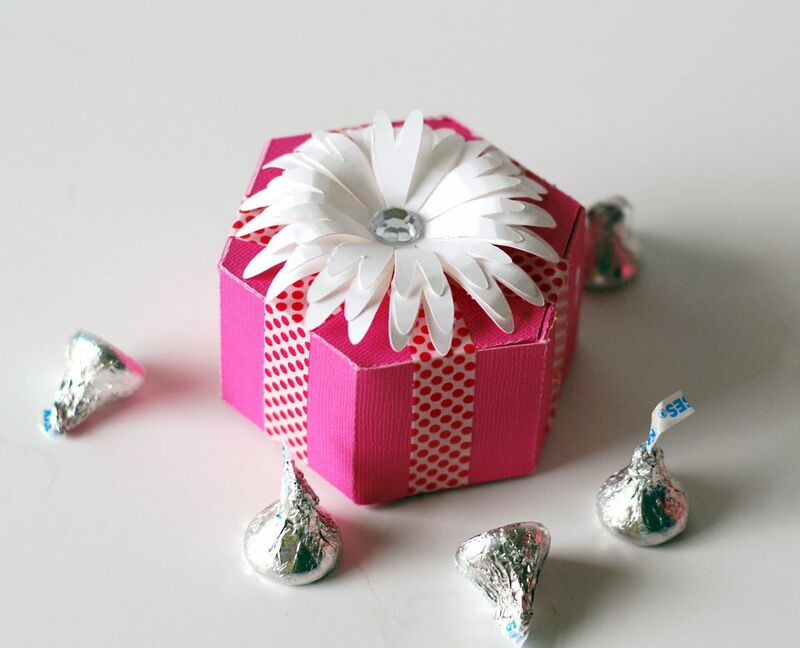 Fill the finished box with some chocolate Kisses and give it to your love. Hexagon favor boxes can also be used for other occasions. They are cute teachers gifts and even make thrifty, fun, wedding and party favors. Just use some appropriately colored paper which coordinates with your party theme to construct the six-sided favor boxes. Your party guests will love the little treats packed inside. 1.Before starting this craft, have all your supplies ready and make sure to download the die cut files and PDF template here. Files for most electronic die cut machines ( .ai..eps,.dxf, .svg, .wpc and pdf) are included in the free download. 2.Cut the template out of the coordinating cardstock papers. If you are you using two sheets of color-coordinated paper, spray the back of one cutout with adhesive spray and attach to the back side of the other template piece. Smooth out the paper with a bone folder. The box will now have a different color outside and inside. 3.The other option is to use cardstock that is already color-coordinated on its front and back side. If you are using this type of paper, you only need to cut out one paper box template. 4. Give the adhesive some time to dry. 5. After the adhesive glue dries, fold the box at the perforated lines. 6. If you are making the box by hand using the PDF file, score the fold lines with a bone folder and then fold. 7. Decide which paper pattern or color you want to show on the outside of the six-sided box and assemble accordingly. 8.. Use the above photo as a guide when assembling the paper gift box. 9. Apply glue or tape to secure the side flap, and press down with light pressure until the flap adheres to the wall of the box. 10. Fill the box with candy or a gift. 12. Decorate each of the six sides with Washi tape. You may use ribbon instead of Washi tape if you so desire. 10. Cut the flower petals using the die cut files or PDF template provided in the download. 11. Curl the edges of the petal around a pen or pencil to give the flower dimension and make the flower look realistic. 12. Stack the daisy petal templates making sure the petals of each template layer align. Put the largest flower petals on the bottom, the medium sized petals in the middle of the stack, and the smallest on top. 13. Secure the petal layers together with a dab of tacky or hot glue between each layer. 14. To give the flower some added pizzazz, place a sparkling gem in the middle attached with tacky or hot glue. 15. Attach the flower to the paper box with two-sided foam tape. 16. The final step is to give your love the box filled with candy and watch their delight as they open up your token of love.